Headphone hanger for studio, game room, computer room, study room. Metal material with painted surface, durable and anti-rust. 7.5cm straight extension part for holding headphone and other objects. 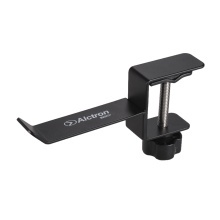 Adjustable clip mount allows you to fix the hanger to desk or microphone stand.